Sciency Thoughts: Fireball over the southern United Sates. Fireball over the southern United Sates. 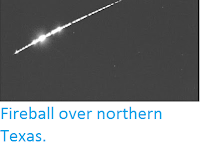 The American Meteor Society has received reports of a bright fireball meteor being seen over parts of the southern United States at about 8.45 am Eastern Daylight Time (slightly after am GMT) on Wednesday 12 April 2017. The majority of the reports came from South Carolina, but sightings were also reported from Georgia, Florida, Virginia, North Carolina, Kentucky and Alabama. A fireball is defined as a meteor (shooting star) brighter than the planet Venus. 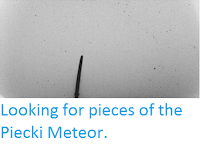 These are typically caused by pieces of rock burning up in the atmosphere, but can be the result of man-made space-junk burning up on re-entry. 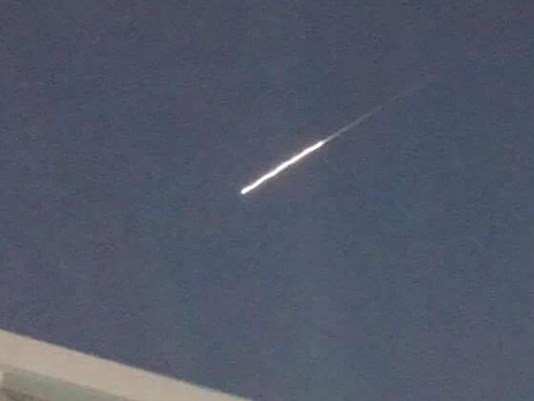 The meteor travelled from northeast to southwest, and was last seen over Horry County, South Carolina. The 12 April 2017 meteor. Ricky Lucas/WLTX-TV. Objects of this size probably enter the Earth's atmosphere several times a year, though unless they do so over populated areas they are unlikely to be noticed. 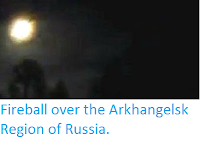 They are officially described as fireballs if they produce a light brighter than the planet Venus. 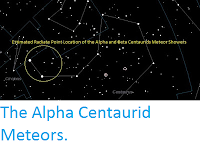 It is possible that this object will have produced meteorites that reached the surface (an object visible in the sky is a meteor, a rock that falls from the sky and can be physically held and examined is a meteorite). Witness reports can help astronomers to understand these events. 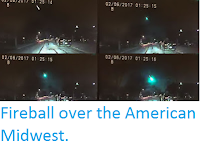 If you witnessed this fireball you can report it to the American Meteor Society here. Asteroid 2017 GK4 passes the Earth. Landslide kills 24 in Osh Region of Kyrgyzstan. Asteroid 2017 HG1 passes the Earth. Asteroid 2017 HJ passes the Earth. Bunker collapse kills two at Indian coal mine. Chemical spill closes Atlanta Downtown Connector. Pair of Earthquakes off the coast of Djibouti. Asteroid (474231) 2001 HZ7 passes the Earth. Magnitude 6.5 Earthquake in Central Botswana. Asteroid 2015 TC25 passes the Earth.